The location of CASTLE Base on Reach (identified here as "CAS"). CASTLE Base was an Office of Naval Intelligence underground facility located within the FLEETCOM Military Complex in Csongrád on the human colony of Reach. It was hidden two kilometers directly underneath Menachite Mountain, part of the Highland Mountains in the Viery Territory. [note 1] Protected by massive amounts of granite, reinforced concrete, plates of Titanium-A armor, and EMP-hardened metal, it was virtually bombproof, well defended, and nigh-impenetrable. The complex was originally a titanium mine, but was closed down after the mine breached the Forerunner complex below. Dr. Catherine Halsey had an office in CASTLE Base's Omega Wing, as did Colonel James Ackerson. The SPARTAN-IIs were familiar with CASTLE Base, some of their training having taken place in the base as well as the abandoned mine tunnels around it. During the Fall of Reach, the base was Team Delta's fallback position. William-043, Vinh-030, and Isaac-039 arrived there. They were soon joined by Fred-104 and Kelly-087. There, they discovered Dr. Halsey, who had remained behind to initiate Operation: WHITE GLOVE, destroying the base to prevent the Covenant from acquiring advanced UNSC technologies. When the Covenant forces breached the base, Dr. Halsey was forced to put Operation: WHITE GLOVE into action, destroying the base and deleting her AI assistant Kalmiya. This prevented the Covenant from gaining any intelligence from the base. Halsey and the Spartans then retreated into the dangerous titanium mines below, and later to the Forerunner complex, where they discovered a powerful Forerunner crystal. 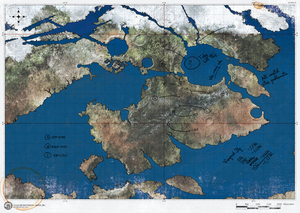 ↑ The planetary map of Reach that comes with the Halo: Reach Limited Edition has "CAS" marked in the central mountain range of the Viery Territory. Judging by how SWORD Base's location is marked a similar callout "SWO" and Visegrad as "VIS", this places CASTLE Base in the Viery Territory.